I have been after the Bold Metal brushes by Real Techniques for ages but could never justify the price! So when my friend told me about Boots having an offer for 3 of their brushes for just £30 (from £64) I knew I had to get them! The Essentials Bold Metal Collection is exclusive to Boots and I believe it is a limited offer so I'd grab it while you can. The brushes themselves are quite pricey where prices range from £25 - £15 for the brushes in the set. So a bundle of 3, with a free clutch, at £30 is quite a good deal! It's a perfect gift, even if you are buying it for yourself like me. The clutch for me was really neither here or there, I know I wouldn't use it but I'm sure my little cousins will be fighting over it! I was hoping it would be a good size to use as a brush carrier, but it's a little tight and I know it would get pretty dirty inside. But it's a nice bonus, especially if you're giving the set as a gift. 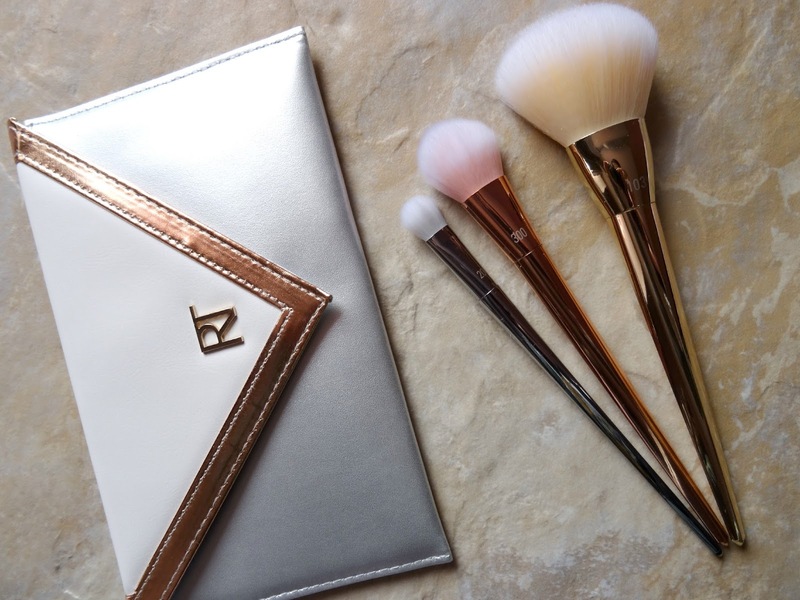 These brushes are meant to be the more premium brushes in the Real Techniques collection and so I had high expectations for them, especially as the normal brushes from the brand are of very high quality. Appearance wise these brushes are aesthetically pleasing and do look very expensive. I particularly like the rose gold brushes and I love that the colour follows through into the base of the brushes hairs. These brushes are weighted towards the ferrel which feels quite odd when you first start using it, but actually it means you can let the brush do more of the work without you having to apply too much pressure when applying makeup. The actual handle is a triangular shape which not only stops it from rolling around on your dresser, but actually fits really well into your hands and gives you a better grip. I have to admit that I did find that the main handle felt a bit plasticy and I wasn't too impressed with it - however, I know that if it was made of a different material it would be much more expensive and let's be honest, it's the brush itself that we all want to be of high quality - and it is! I honestly did not think that Real Techniques could make softer brushes than their original line but they really have stepped up their game and produced something even better! They don't feel scratchy at all and are so gentle on the skin that it makes applying makeup quite therapeutic - as if it wasn't already. I really like the brush selection in this collection. I didn't care much for the eye brushes in the bold metals collection and when I saw the picture of this set online I didn't think I'd use the Oval Shadow (200) brush too much but actually it's a pretty big brush and you could easily use it for setting your under eye makeup or applying highlighter to your cheekbones The Tapered Blush (300) brush is also perfect for setting your powder but I think it would be ideal for contouring as it's tapered shape means you can get right into your cheekbones and get that nice sharp contoured look (if you're into that - I am!). Lastly, the big Arched Powder (103) brush is probably my favourite. I use the Powder brush from Real Techniques to set my makeup but I sometimes I feel like it's too big, so when I saw this brush I knew it would be a good replacement as you have more control! I have a smallish forehead so a slightly smaller powder brush is perfect for me!